YELLOW SPRINGS — The Greene County Sheriff’s Office is investigating a possible homicide in Yellow Springs. The body of Leonid Clark, 26, of Yellow Springs, was discovered by three men hunting mushrooms April 12 in Glen Helen Nature Preserve near Grinnell Road near the river. The Miami Valley Regional Crime Lab was able to identify the body as Clark’s by his palm print. Clark was reported missing to the Yellow Springs Police Department Feb. 5 by his family. According to Yellow Springs Police Chief Brian Carlson, Clark had not made any contact with his family or had been active on social media since Jan. 13. According to Fischer, the body is believed to have been carried downstream by high waters due to periods of heavy rainfall during the winter and spring months. The body, fully clothed, is believed to have been dumped approximately a quarter mile east from where it had been found and was snagged on debris downstream, Fischer said. “So the actual crime scene on Grinnell Road — we believe the high water carried Mr. Clark’s body downstream and so east of where he was discovered, which is about a quarter mile downstream from Grinnell Road — upstream from that is where we think the body may have been dumped,” Fischer said, adding that the body indicated that the water level was high. According to Carlson, Clark was known to go “off the grid” and travel west in the past to visit friends, but would stay in contact with his family. When his family had not heard from him for “a few weeks,” they reported him missing. A search was conducted, involving 12 K9 units, handlers and others from Buckeye Search and Rescue as well as other organizations. An aerial search of Glen Helen, John Bryan State Park and surrounding properties also took place. Carlson added that if the body had been frozen under water at that point that the dogs would not have been able to detect the scent. No other individuals are currently reported missing in the village, according to Carlson, adding that the Yellow Springs community should follow normal safety precautions. The Greene County Sheriff’s Office has opened up a tip line concerning the crime. Individuals with information are asked to call 937-562-4811. Whitney Vickers | Greene County News Greene County Sheriff Gene Fischer (right) and Yellow Springs Police Chief Brian Carlson (left) during a press conference April 17 to discuss a possible homicide investigation in Yellow Springs. 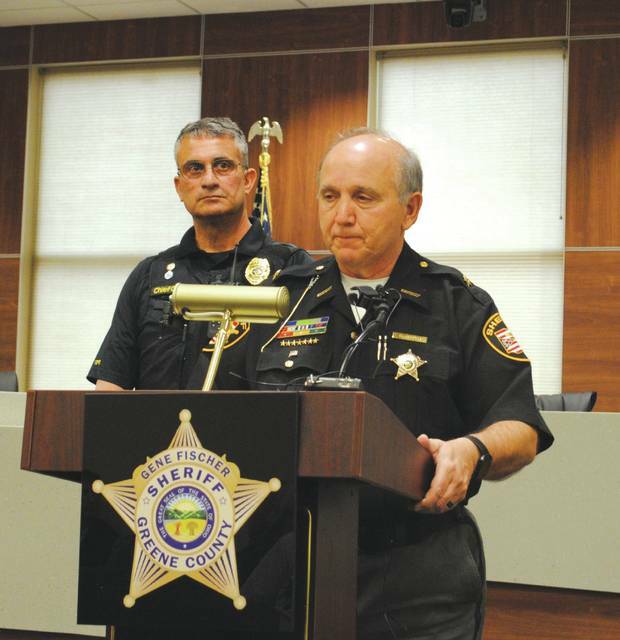 https://www.xeniagazette.com/wp-content/uploads/sites/32/2019/04/web1_yspdpressconference.jpgWhitney Vickers | Greene County News Greene County Sheriff Gene Fischer (right) and Yellow Springs Police Chief Brian Carlson (left) during a press conference April 17 to discuss a possible homicide investigation in Yellow Springs.